As soon as people found out that Superbowl 50 was going to be played at AT&T Park in San Francisco, they immediately petitioned to have Metallica play the halftime show. The petition garnered a lot of signatures, but that didn’t matter to the NFL who deemed Metallica Too Heavy For Halftime which was also what Metallica dubbed their concert the night before the Superbowl at AT&T Park. As James Hetfield, lead singer of the greatest metal band ever told fans that they basically got the better deal because instead of a short three song set, they received a whole entire concert complete with a new stage setup as well. By the time the band ht the stage Saturday night, the weather wasn’t too bad as it was a nice 61 degrees out and the crowd was ready for one hell of a show. James, Lars Ulrich, Kirk Hammett, and Robert Trujillo all looked in shape and ready to roll as they broadcasted the show online as well for fans who couldn’t make it. Metallica didn’t waste anytime when they hit the stage playing the classic Creeping Death which got the crowd’s blood pumping. They followed it up with For Whom The Bell Tolls which kept the momentum going throughout the show. The show was a mix of old and relatively old as they played everything from Kill Em All all the way up to Garage Inc. While the band sounded amazing there were a lot of times where Kirk would miss a note on a couple of songs, but he would quickly catch himself. The band still does their guitar solo, bass solo parts in between songs which seems to be an art that is kind of missing in metal concerts. Metallica kept the crowd going and they never faltered as they kept up with everything Metallica threw at them creating an amazing atmosphere. Some of the highlights for me during the show was surprisingly hearing some of the material from Load and Reload like Fuel, King Nothing, and The Memory Remains mixed in with the old material. As you get older, you gain an appreciation for the material. The Dimebash is an event that takes place every year the honors the legacy of one of metal’s finest that was taken away too soon. At this years Dimebash which was also the 11TH took place in Hollywood as some of metal’s biggest names came out like Robb Flynn (Machine Head), Dave Lombardo, Phil Anselmo (Down, Ex-Pantera), Robert Trujillo (Metallica), Gary Holt (Slayer, Exodus), Phil Demmel (Machine Head), Ray Mayorga (Stone Sour), Rex Brown, and so many more. The performance I chose for all of you as the cover of the week comes courtesy of Phil Anselmo on vocals, Dave Grohl on guitar, Robert Trujillo on bass, and Dave Lombardo on drums performing Ace Of Spades as a tribute to the late Lemmy Kilmister. The audio quality isn’t perfect, but you’ll get the picture as the boys bring the noise. Listen to what Phil says before hand, it’s crazy what comes out of his mouth, but it’s funny. When it came to deciding what album I wanted to cover for the album of the week, I took to Jamey Jasta of Hatebreed’s podcast The Jasta Show for some much needed inspiration. That is when I saw that Mike Muir, the legendary singer of Suicidal Tendencies, was the guest for his podcast in one of his episodes and I instantly made my decision right then and there. 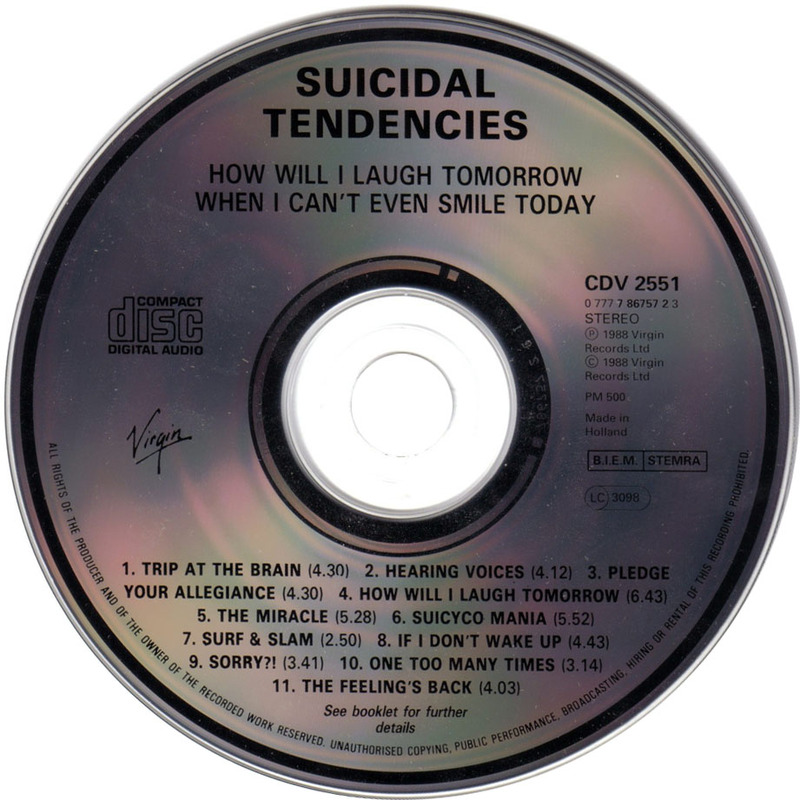 The only question is what album would I pick and I chose How Will I Laugh Tomorrow If I Can’t Even Smile Today because it was the first record I ever picked up from them. It was a monumental step in a direction the crossover thrash legends were heading at the time as they shed their punk rock roots for a more metal sound. 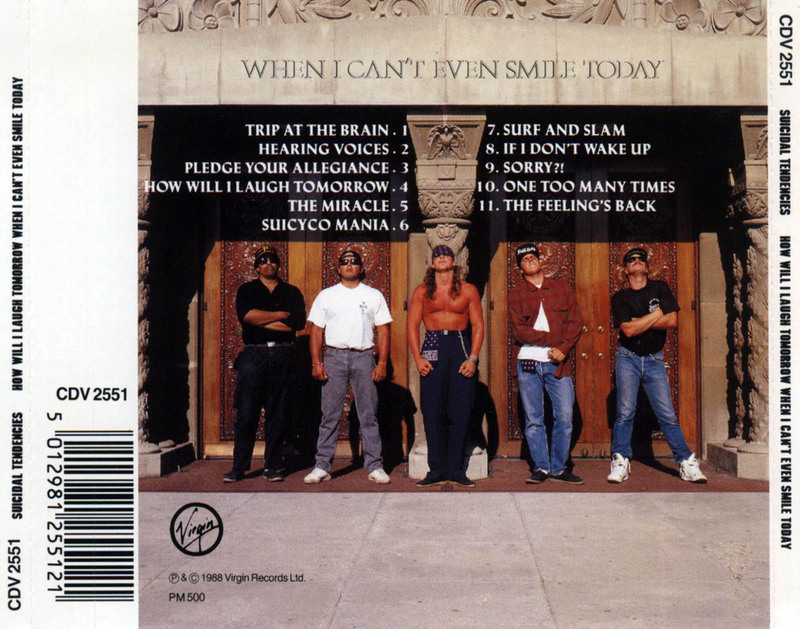 The band at the time was made up of Muir (Vocals), Rocky George (Guitar), Mike Clark (Guitar), R.J. Herrera (Drums), and Bob Heathcote (Bass) who was replaced by Robert Trujillo the very next year. The album was also the debut of Mike Clark who added that metal element to the band as he was in a band with Muir that was supposed to be an all metal project. It also allowed Rocky George the chance to work on more lead guitar duties as well and this also marked their major label debut for Epic Records. The album peaked at number 111 on the Billboard Top 200 charts where it stayed for 11 weeks. 4. How Will I Laugh Tomorrow– The title track is the perfect anthem for the youth who look at what is going in society and ask the question how will I laugh tomorrow? My Final Thoughts– This is definitely the best album in my opinion that the band put out as it demonstrated exactly what the band could do. Out of all the crossover thrash bands of the 80’s they were definitely my favorite and still are today. 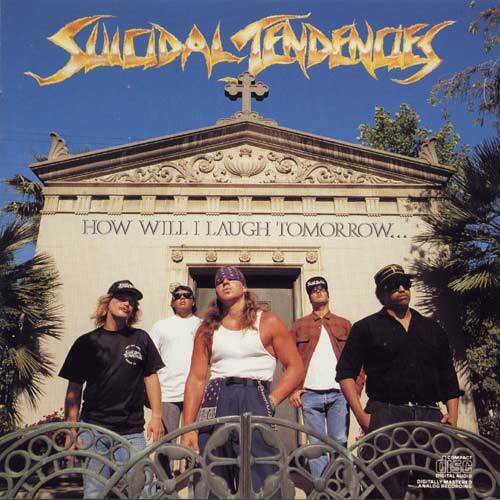 I would definitely pick up this album if you want to hear some stuff from Suicidal Tendencies. I am giving the album 4.2 stars out of five for a final grade. Yes, it’s Saturday which means everyone should be getting ready to party because before you know it the weekend is over and it’s back to work. Saturday for me also means that I get to choose another song that was specially written for a film’s soundtrack for Soundtrack Saturdays. I was watching the documentary that Pauly Shore recently released and it made me remember how much I loved the soundtrack to his film Encino Man that also starred Brendan Fraser, Sean Astin, and the beautiful Megan Ward. One of the songs I distinctly remember hearing besides the Vince Neil classic was a funk classic called Feed The Monkey performed by Mike Muir (Suicidal Tendencies) and his other project called Infectious Grooves. This was the band that first introduced the metal world to Robert Trujillo before he joined Ozzy Osbourne and later Metallica. The song features elements of ska in it besides the that funky bass line that reminds me of classic funk bands from the 70’s and one of my favorites Morris Day & The Time and also a little bit of Faith No More. The musicianship on the song is pretty phenomenal as well, I’m just surprised these guys weren’t bigger than they were. Check out the track below and be prepared to slam dance to some great funk metal. Last night, HBO held The Concert For Valor at The National Mall in Washington DC which was a tribute to all the men and women that serve in the United States Military to celebrate Veterans Days. One of the bands that appeared on stage at The Concert For Valor was Metallica who was given a tremendous introduction by Jack Black. The band opened up with For Whom The Bell Tolls and one of the coolest things you could notice besides the band ripping it was the fact that several men and women of the United States Military and their families were behind the band on stage as they rocked out. The band would then perform Master Of Puppets which was followed by set closer Enter Sandman. The concert also featured Dave Grohl, Bruce Springsteen, Eminem and others, but this is where it’s at if you’re a fan of metal. I have their set for you below, so check it out and bang those heads.